The educational goal of the SIU School of Dental Medicine is to prepare graduates to become the best general practitioners of dentistry in the country. The School’s small student body (200 students) and intimate environment promote an unusually high level of interaction among students and faculty. The dental curriculum is a structured program that requires all students to participate in a four-year course of study that culminates in the awarding of a doctor of dental medicine degree. The primary dental education facilities of the SIU School of Dental Medicine are in Alton, Ill. Most student clinical experience is provided in the Main Dental Clinic in Alton. Other facilities in Alton include a comprehensive biomedical library, biomedical and clinical research laboratories, a preclinical laboratory and classrooms. A summer research program is available to students who are interested in gaining research experience. In addition, experience in diagnosis, treatment planning, surgery, and prosthodontic treatment for implant dentistry are offered in the Advanced Care Wing of the main clinic in Alton. Rotations to the community-based East St. Louis Dental Clinic offer students an extra opportunity to provide dental care to patients in an underserved area. 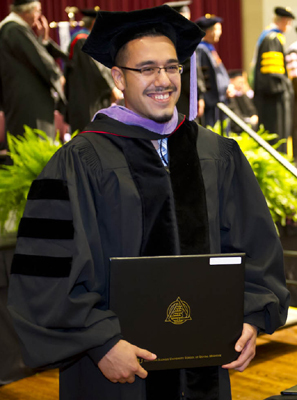 The SIU School of Dental Medicine assists its students in choosing and pursuing their personal post graduate interests. About half the School’s new graduates enter private practice, while 25 percent choose to continue their education in graduate and specialty programs in hospitals and universities throughout the country. Others pursue options including military or public health service, dental research, dental education, and careers in a variety of government agencies.